Take a picture of a cat doing something cute. Then make up a caption--something witty that the cat would be saying if cats could talk. Bear in mind that cats can't spell all that well and that they're not so hot on subject-verb agreement either. Photoshop the caption onto the image, and post your creation on a blog. What you get is lolcats: lol for laugh out loud, cats for cats. What you also get is the reigning instance of an Internet meme, a running gag that won't stop running but instead reproduces and mutates in the petri dish of the Net's collective imagination. 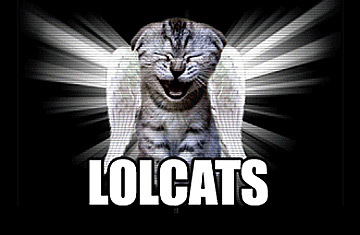 A Google search for lolcats returns 3.3 million results. The website icanhascheezburger.com the definitive lolcats archive, gets 200 to 500 submissions a day. "The breadth of cultures [lolcats] has spread to is mind-boggling," says one of the site's two curators, who prefer to remain anonymous. "We think it has evolved beyond Internet subculture and is hitting the mainstream."